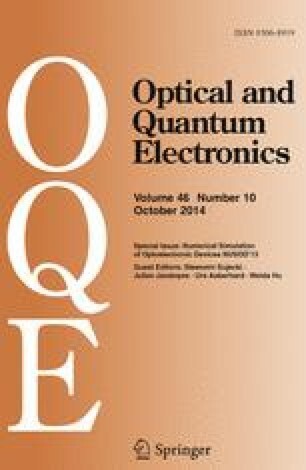 In view of integrated nanostructured devices we investigate the impact of an electro-optic modulator (EOM) section on the light dynamics of an adjacent quantum-dot (QD) laser. Using the Lang–Kobayashi model we analyze the nonlinear dynamics of the coupled system. We determine the effect of the detuning between the optical transition of the EOM and the QD laser and the influence of the material model of the EOM on the QD laser dynamics. The model of the EOM is based on Maxwell–Bloch equations with voltage dependent loss rates. We thank B. Lingnau for fruitful discussions. This work was supported by DFG in the framework of Sfb 787.